It is World Animal Day today so we are putting the spotlight on an animal-themed chess set. This year it´s a chess game from the J.M. Glotzbach Collection: a green and purple coloured set made of soapstone. There are quite a few animal-themed chess sets at the Chessmen Museum. Animals are much beloved models for chess pieces. There are a variety of them at the museum: classic animals from the Fables of La Fontaine or modern animals such as seen in the Snoopy chess game. The battle between our favourite pets is also a theme, as we can see in the Dogs and Cats chess game. Another striking and unusual set with animals in the lead role is number 34 from the J.M. Glotzbach Collection. This is an antique chess game and its pieces are made of dark green and deep purple soapstone. J.M. Glotzbach Collection, nr 34. Soapstone is a popular material to work with. It is quite soft, which makes it easy to cut. The common mineral is officially called talcum, though some members of this mineral family are called lard stone or soapstone because the greasiness and softness of the material are reminiscent of lard or soap. The museum is also home to some African chess games made of soapstone. Soapstone or lard stone comes in a wide range of colours. The more iron it contains, the greener it gets. The pieces of this chess set represent different animals. The bishop is a wise owl and the knight is, unsurprisingly, a horse. The other animals are a bit more difficult to define. The round figures resemble a variety of primates. The king looks somewhat like a Malaysian proboscis monkey. The pawns, with stripes on their faces, resemble the Kenyan mandrill. The country of origin of this chess set is unknown, which makes it impossible to determine which animals we are looking at here. In any case, monkeys are highly popular models in the world of art. The symbolism of the monkey does vary enormously. In cultures where monkeys are part of the natural environment, they are often represented in a much more positive way than in Western culture. 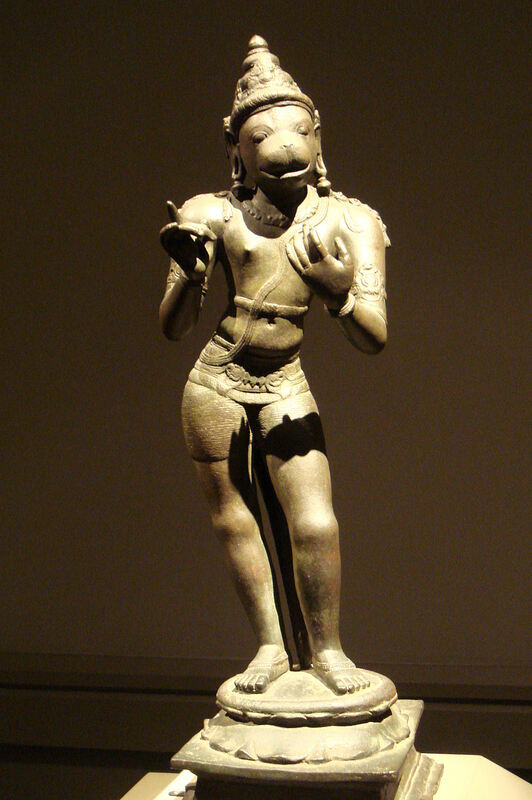 For the Mesoamerican Aztecs, the monkey was a prominent symbol in their calendar; the ancient Egyptians considered the monkey a sacred animal and Hindus worship Hanuman, the speaking ape god. In Europe, the image of the monkey was usually used as a warning. It showed the spectator the bad qualities of mankind. For example, printmaker Johann de Bry published an allegory on the vanity of man in 1596. 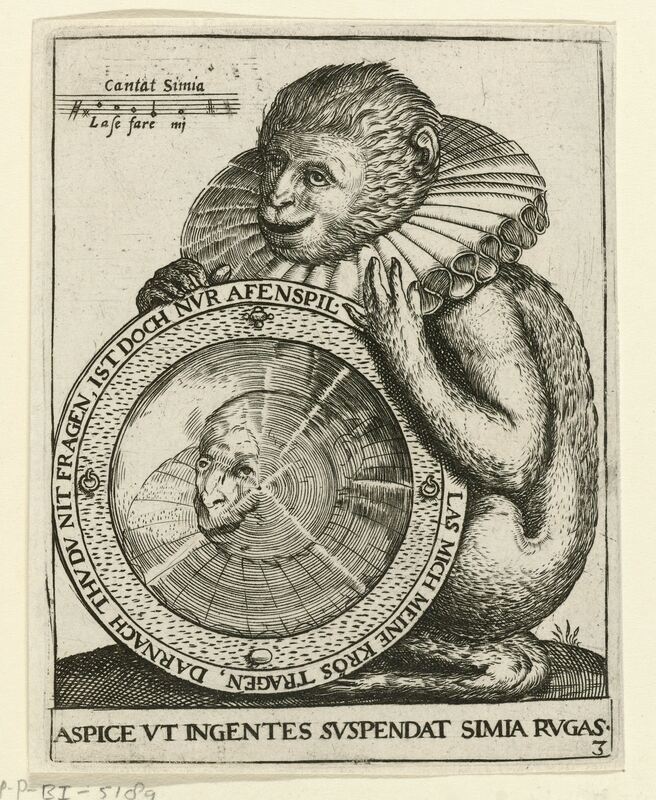 A monkey, adorned with a large millstone collar, is holding up a round mirror in which her reflection can be seen.